Really awesome! I love it! It is a remarkably fitting charachter now that i think on it. Anyway, sir, well done! Great detail where the thigh meets the hip!! This is fantastic. The detail and design are utterly amazing! Epic! Awesome. Also, I think this may be a steampunk first (at least for me)... steampunk Harley! So very wicked! Definitely my favorite girl! thanks - glad you like her! 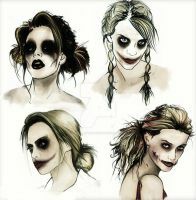 I've been looking high and low for some awesome Harley Quinn pictures to use as reference material for a tattoo. 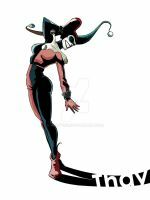 sorry i have this unhealthy obsession whit Harley.